The historically low quality of Kiwi housing stock has been confronted by building of the first 9 and 10 Star homes in New Zealand. The demonstration project of two adjacent homes in Church Square aimed at showing what is possible and creating public awareness to destroy the myth it is too expensive to build energy efficient homes. The two exemplar homes 9 and 11 Church Square Addington were originally designed to 9 Star with one rating a perfect 10 on the HomeStar rating scale. This changed the game and put the challenge out to architects, designers, builders and home buyers to aim higher. Bob Burnett of Bob Burnett Architecture announced the 2015 successes to visitors, media and industry in August 2015. “What is stunning is energy efficient houses don’t cost more if the designs are designed around energy maintenance from the get go. The issue is NZ house designs are at best stuck in the 1980s, it’s like everyone is living in houses the equivalent of driving in old Ford Escorts,” said Bob Burnett. “Cost comparisons can be seen in the excellent resources on the NZ Green Building Council website (http://www.nzgbc.org.nz/) where research is shown, and where local architectural projects are highlighted. We will continue to work with NZGBC and other architects and builders. Zero Power bills- that is in these houses there is no need to buy power, it’s that efficient. Affordability is not only about purchase price but running costs. Significantly lower ongoing running costs for both houses make the return on investment in owning them much higher. Hydronic underfloor heating – incredibly innovative floor systems that circulate monitor and manage power for maximum comfort and optimal energy use. Slab -edge insulation -eliminating the loss of energy from flooring that is standard Kiwi practice. This simple innovation is a major difference used by Bob Burnett Architecture. Quake resilience through design innovations and lessons developed in Christchurch and in California and Japan. Optimal use of space, in New Zealand houses and cars have developed the same energy inefficient obesity with expansion in houses that consume and waste energy. The building design and utilisation of space build on Japanese expertise and clever Kiwi design. Solar wall ventilation- Energy efficient lighting – not just LED lighting but lights that follow use and also reduce lighting waste and pollution. Visit the homes by making an appointment with Bob Burnett Architecture and see for yourself what the homes of the future will have to look like, and feel the difference. Superwalls- super-insulation, designed to eliminate thermal bridging, stronger, at least 140mm framing, airtight – the best walls and destined to revolutionise the construction of substandard walls used in most Kiwi houses. At Bob Burnett Architecture we have always said we are at the leading edge of creating the homes New Zealand deserves. Energy efficient dwellings which are examples of best practice in design and construction are a critical part of our method. The team has been at the forefront of excellent design and building excellent houses. 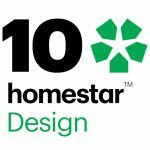 We built New Zealand’s first 8, 9 and 10 Star Houses. Rated on the 1-10 scale we have led the awareness and expertise in creating houses that can return power to the network and ensure comfortable healthy living. Specifications: A 140m2 two storey three bedroom dwelling with two spacious high standard bathrooms and attached carport. This is NewZealand’s first 10 homestar rated home; it needed to tick all the boxes to score a perfect 10 and also has a 5 Star Lifemark standard. Super-insulated and super-energy efficient with no power bill, an environmentally sound dwelling that is very healthy, warm, dry, comfortable and also attractive, liveable, incredibly practical, and delightful to live in. There are over 30 innovations that are not common in typical NZ homes. The ground floor accommodates a large living room utilising passive solar principles, with the centrally located stair separating the entry, kitchen/dining and utility areas, like toilet, laundry and walk in pantry. The attached car port provides covered rear access. The stair landing has space for an office desk and storage each side. The Master bedroom has a large ensuite, good storage and access to a small balcony. Efficient space planning eliminated waste space, for example no hallway. The home relates very well to the Church Square environment. Designed as an exemplar home and demonstration project for the SUPERHOME movement providing open source sharing of design, technology and information for public and the industry. The idea has been to create awareness by sharing ideas through a network of industry leaders in home design and construction on how best to build compact but spacious, clever high rated homes for the mass market that provide the best possible value in terms of affordability and ongoing cost of ownership and return on investment.